Nestled in the Santa Cruz Mountains, The Inn at Pasatiempo is a coastal lodge of warm, attractive settings, country charm and superior hospitality. We're adjacent to the famed Pasatiempo Golf Course and fourtyfive minutes from San Jose Airport, so it's easy to explore the beauty of California's scenic central coast, which includes area wineries, the Boardwalk, the Monterey Bay Marine Sanctuary, and Aptos Seascape. 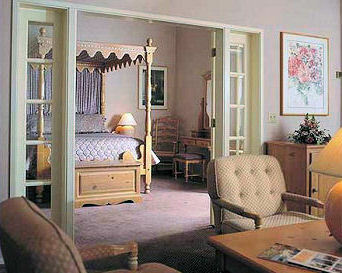 At The Inn at Pasatiempo, we're committed to providing an ideal environment for a memorable and comfortable stay. You'll enjoy our delightful atmosphere combined with superior hospitality for the perfect retreat. Enjoy complimentary room service, Peachwood's Steakhouse & Lounge, outdoor pool, and a front desk with fax and copy services. complimentary juices, pastries and coffee each morning and USA Today newspaper Mon-Fri.